To add interest I have interspersed this commentary with thought provoking quotations from philosophers, ethicists, scientists and other notable thinkers both past and present. This is an amazing film that will reveal a side of farm animals of which few people are aware. In any endeavour to gain rights for animals is the need for recognition that animals are sentient creatures, aware of themselves, others of their kind and other species, aware of sensations in their bodies, along with the capacity to experience negative and positive emotions, both pleasure and sorrow, and the ability to experience both a state of pain and that of wellbeing, capable of suffering both physically and psychologically. It is my view that whether sentient or otherwise we have no right to interfere with the lives of animals, to exploit or abuse them in anyway. Nonetheless the cause of animal rights is enhanced if we can establish that an animal is sentient. Because one species is more clever than another, does it give it the right to imprison or torture the less clever species? Does one exceptionally clever individual have a right to exploit the less clever individuals of his own species? To say that he does is to say with the Fascists that the strong have a right to abuse and exploit the weak - might is right, and the strong and ruthless shall inherit the earth. I think few people believe that animals, if they really consider animals at all, live their lives totally automated by instinct. It would not be possible to interact with your environment without some degree of awareness, intellect and an ability to think, to reason and analyse each situation as it arises and to act accordingly. All animals have some degree of instinct, yes even humans, but in addition there is sentience, conscious awareness, no creature is an automaton. 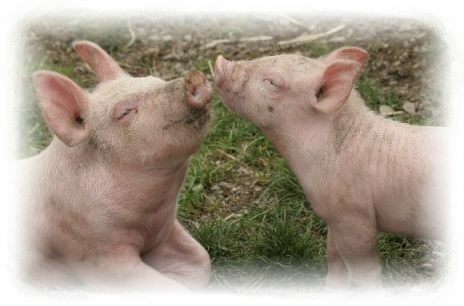 Often when challenged those in favour of farming and other exploitative practices justify such by saying that animals have no feelings and that they are not aware, that they lack sentience. Such arguments in light of recent research now stand on extremely shaky ground. Scientists are finding compelling evidence to indicate sentience in animals, however until recently most of the research into this possibility was not carried out on farm animals but upon primates and dolphins and other animals, so called higher animals, commonly considered as intelligent. There are definite indicators of sentience in the aforementioned animals, such as self awareness, the awareness of others, intelligence and the ability to communicate and to experience a range of emotions, to name just a few of the more well known indicators of sentience. Most people are particularly aware of the intelligence of dolphins concerning these abilities, whales also display a similar capability and it is clearly obvious that this applies to primates, our nearest relatives. Sadly such research is only just being carried out on farm animals. I would imagine that this is due to the fact that the industries which exploit animals for food, clothing and so on would really rather it not be known that these creatures regarded as resources are thinking, feeling, intelligent beings, who are aware, sentient. It is my belief that all creatures are sentient, all animals to include both vertebrates, (animals with a backbone and internal skeleton), and invertebrates, (animals without a backbone and an external skeleton, for example insects), the later of which sadly few consider sentient. I consider and always have that insects, arachnids and other invertebrates are sentient, and in time I will include information about them also. Indeed I have never considered otherwise that animals where not sentient, aware as are we, it has never occurred to me that animals have no feelings or emotions. Sentience in animals, including farm animals, to my mind seems as obvious as rain is wet and the sun is warm. It has in fact always shocked me when I meet people who believe otherwise. One of the most significant problems in assigning sentience to other animals is that we look for a similar type of sentience to that of our own. And if we find there is little comparison we consider that the animal in question is not sentient. Therefore in the consideration of animal sentience perhaps we should consider that maybe animal sentience is different from our own. For instance, often people think that because we cannot communicate with certain creatures on our own level of awareness, such as for instance a reptile, that this particular creature is not sentient. Many people, are prepared to accept that certain mammals, but not farm animals, other than ourselves are sentient, such as a cat or dog for instance, simply because these creatures are aware of us and interact with us on many levels. Reptiles and insects do not interact with humans in the same way as mammals and this results in many people considering that these creatures are not sentient. However many smaller mammals, such as certain tiny species of rodents in particular are not aware of our existence either as their periphery of perception excludes us other than perhaps for instance casting a shadow if we approach them. Therefore, for all intents and purposes it might seem that these creatures also appear to lack sentience. Man is an arrogant creature it seems and if another animal is not aware of his existence, man tends to believe that, that creature lacks sentience. In the above article you may read scientific, philosophical, personal and anecdotal evidence to support animal sentience. Topics include subjects such as intelligence, communication, tool making, emotions and how they manifest in animals and sixth sense. This is a lengthy article which will be revised and more information added as it becomes available. Credit Photo: (c) 2008 by Wanda Embar, Vegan Peace. Picture taken at Farm Sanctuary.